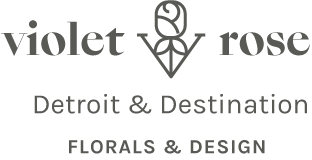 We specialize in artful floral arrangements for weddings and events in Detroit, Chicago, and all around the world. Whether you're dreaming of a destination wedding or a gala in your hometown, we'll transform your venue into a bloom-filled backdrop. Ribbon-wrapped bouquets, cascading hanging arrangements, & focal-point floral installations. We love filling grand ballrooms, historic estates, modern barns, and downtown lofts with lush florals.